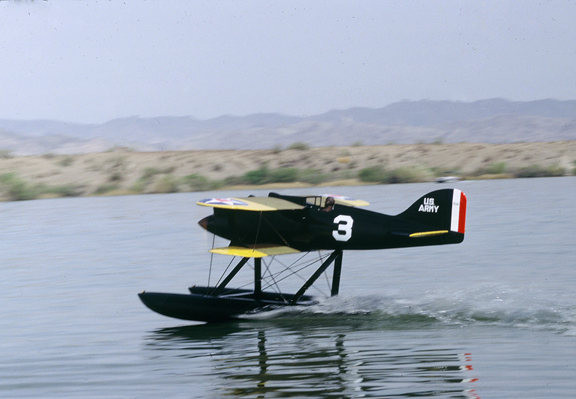 In 1988, a team and I built a 1/3rd scale replica of the Curtiss R3C2 Schneider Trophy Racer that Jimmy Doolittle won the 1925 Schneider Trophy race. It was sold to HL Skates (Penn Int’l Chem) and competed in the 1989 and 1990 Schneider Cup Reenactment event in Lake Havasu, AZ and appeared on the cover of many RC magazines. We are trying to find out whatever became of this RC Aircraft. I would appreciate it if anyone who has any information would email me and let me know. Lake Havasu City. Click Here to see her transformation. We chose the Curtiss R3C-2 because it was the winning aircraft in one of the two USA victories. It was also flown by a test pilot that would later become one of Americas most famous racers and war hero, Jimmy Doolittle. We only found one Curtiss R3C-2 plan and that was by Don Smith. His plans were for a ¼ scale Curtiss on wheels. The aircraft Doolittle flew was flown a few weeks earlier in the Pulitzer Race (with wheels). It was then quickly fitted with floats for the Schneider Cup Race. Don did not offer scale float plans. Don agreed to enlarge his plans to 1/3rd scale for us. We bought the plans and Bob Martin said he could design a set of scale floats. All of the Schneider Cup aircraft that were built for our event were major projects requiring lots of time and many skills. Every entry was a scratch built masterpiece of engineering. On our Curtiss R3C-2, the engineering and building crew was John Hanks, Jerry Leciej, Bob Martin, Larry Tate and Bob Whelan. J.T. Scott and his spray gun applied the final coats of butyrate dope. When the plans arrived, we set about re-engineering the spars, stringers etc. that needed to be changed. Remember, Don enlarged his plans, so everything got bigger. We made Xerox copies of parts and ironed them onto wood blanks. The two wings are different chords but are constant chord, so we made jigs to bulk cut and sand the ribs. Bob Martin began making the fixtures while Larry, Jerry, and Bob Whelan took the Xerox copies of the plans and began cutting out wingtips, fuselage crutch, stab and vertical formers. When the fixtures were done, we cut out all parts and matched them to the templates on the plans. As the various parts were prepared and separated into components we had our kit, less the Cowl, struts, and floats. Bob Martin began designing and engineering the scale floats, struts, and attachments. The Cowl on the plans was incorrect. John Hanks brought in a book published in 1926 that had a scale 3 view of the Curtiss V-12 engine used in the R3C-2. John and Bob Martin drew the engine at 1/3rd scale then lofted the cowl around it using photos as guides. Using the stations they just created, John went to work making a plug for a fiberglass mold we will use to make our cowl. Bob went back to designing the floats. One thing to take special care of during the process of a build like this is safety because none of it will have been worth it if a serious injury is the result. 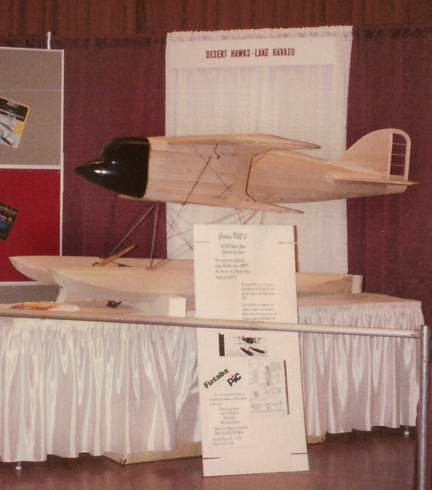 Under Larry Tate’s leadership, the guys began by assembling the left fuselage half and the upper wing. Soon, though, we ran into trouble. For some reason, the fuselage did not form a smooth arc. As we studied the problem, we determined that the a was not correctly drawn and as we modified each former, we corrected our fixtures so future parts would be correct. Constantly checking each succeeding step, we continued to build the Curtiss. The wings were sheer webbed on both sides of the spruce spars, in retrospect probably overkill. The fuselage was planked using 3/32″ x ½” x 48″ balsa strips glued to the formers and to each other. We worked ferociously, taking turns on each team to get our Curtiss far enough along to gain some publicity. By the end of September 1988, the big aircraft was still in bare bones and far behind schedule. In hopes it would generate some interest, we took it to the QSAA (Quarter Scale Aircraft Association) annual meet in Las Vegas. We were not disappointed as three magazines took pictures that ran with their coverage of the QSAA event. Hundreds of modelers spent a lot of time asking us questions about the Curtiss and the Schneider Cup Re-enactment. Three Schneider Cup teams formed and became ardent supporters of our Schneider Cup event because of this effort. Encouraged by all this enthusiasm we decided to display the Curtiss every chance we got and so we did. Bob and Katie Martin, (Bob Martin RC Models) volunteered to take the Curtiss to trade shows in Phoenix, AZ, and IMS in Pasadena, CA. We tried to figure out a way to get it to the Toledo and White Plains shows plus the Clearlake Float Fly but crating it up safely and cost of transportation got out of hand. 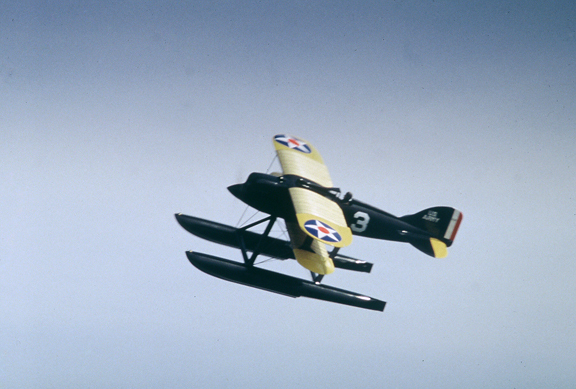 The Curtiss was doing its job of creating interest in the Schneider Cup Re-enactment, however, no work was being done to complete it during all of these outings. Catch 22. We tried to finish the Curtiss as close to scale as possible. This included finishing materials. After we planked the fuselage, we sanded and applied nitrate dope and talc several times until the surface was smooth. We then applied one layer of ¾ oz. fiberglass cloth with nitrate dope, and several more coats of nitrate dope and talc until the fabric was filled. Final sanding for a perfectly smooth surface and a coat of nitrate with aluminum powder for our base. The wings were covered with a light ceconite material and applied with nitrate dope. Once the fabric was sealed and shrunk up tight, a coat of nitrate dope and the aluminum powder was applied. At this point, how scale do you want to be? This was our showpiece and promotional vehicle, the answer was simple but what that required was not. The R3C-2 has radiators on the top and bottom of both wings. How to simulate these and keep the weight down took time to figure out. 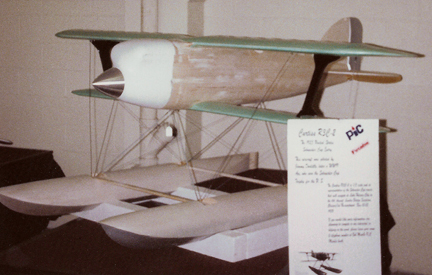 Larry Tate and Bob Martin came up with using 1/64″ plywood as the base and 1/8″ triangle balsa to simulate the corrugations. Larry Tate, bless his soul, volunteered to tackle this all-important project. Each strip of balsa triangle was glued edge to edge until the complete area was covered. Eight panels in all and over 500 feet of balsa triangle were used. The tops of the triangles were sanded lightly so as to replicate a corrugated surface and when painted the bottom of the V was partially filled to finish the look. This was a major reason the Curtiss was so impressive. Larry lost a lot of skin as the CA glue would migrate and glue his finger that was holding the strip in place. We appreciated his sacrifice. About the finish of the Curtiss R3C-2. Thomas Foxworth, aviation historian and author of The Speed Seekers (Excellent Book) was of tremendous help in many ways. He sent us a video of newsreel coverage of Doolittle’s flight, more on that later, and was a consultant to the Air Force who restored the original R3C-2 that is on display at the Smithsonian. The plane was to be finished in butyrate dope. By the first of May, all paint and details had been completed and the Curtiss was ready to go, except for the radio. As a manufacturer of RC kits, Bob Martin had a deal with Futaba and we needed a fancy radio with mixing so Bob worked out a deal with them. Bob was chosen as our pilot because he is our best pilot and does not get nervous flying new unproven aircraft. Bob has a weakness though, his left thumb. He has not had much experience where the rudder was mandatory to coordinate the turns. He has flown full-scale aircraft but you use your feet there. It would be nice to give Bob’s stupid thumb some help, so we got a Futaba 7UAF with aileron/rudder mixing. The radio arrived on the 17th and we hurried ourselves hooking up the electronics. Bob set up the differential aileron throws 100% up/50% down, and 35% rudder mix. Just in the nick of time as Norm Goyer had scheduled a photo shoot of the Curtiss first flight on the 22nd of May. The day before the test flight, we staged a few photo opportunities. 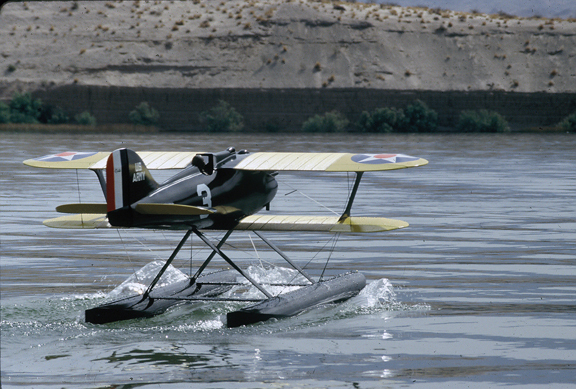 This outing is a test flight of the Curtiss, but it is also a cover and article shoot for Scale RC Modeler Magazine. Norm Goyer has taken the time to come to Lake Havasu for the first flight, so let us get a few potential cover shots before we risk the plane. A couple of local young ladies were chosen to pose with the Curtiss. 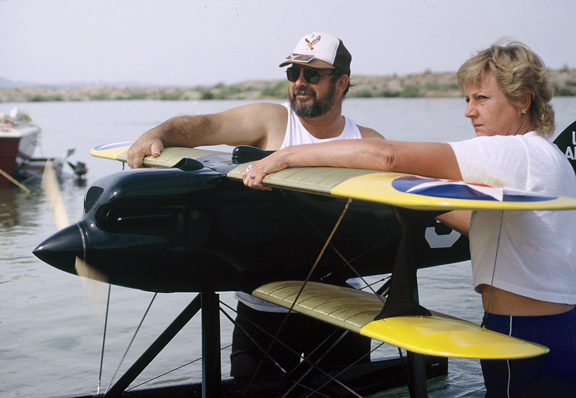 The morning of May 22nd, 1989, Lake Havasu was calm, the air is still and the Curtiss is ready, at last, to be kicked out of the nest. It’s time to see, after nearly ten months, whether this beautiful Curtiss R3C-2 really will fly, so it’s off to the water. A party of 12 people, the builders, the video folks, the press, and our pilot ventured to our favorite spot on Lake Havasu and gently set the Curtiss into the water. The beast sat there just begging to be started and show us what she had to offer. Thanks to Norm Goyers’ expert tuning the day before, the Sachs 3.7 hidden inside the sleek black cowl, burst into life, swinging a Zingali 22 6/10 prop with a vengeance. In the run-up, Larry Tate and Katie Martin are holding the Curtiss. They are standing on a sandy bottom in the water. Katie says that she is slipping forward every time the throttle was advanced. “I believe in having plenty of throws in case I need them, but I know how to use only the amount I need. The 39 pound, eight foot long, 1/3rd scale R3C-2 seaplane leaped forward at the touch of the throttle and was soon planning on the step. I applied more elevator, and more again, then fed in all of the “UP” I had (which was a bunch), but the big bird still refused to lift. My heart began to sink, and I was about to give up when, suddenly, the Curtiss shot skyward. Level off I silently told myself, now gently bring her around. Careful, keep up the airspeed. As our proud giant turned and came roaring back and past us, my spirits lifted, even soared and all thoughts of the time, the worries, the lost sleep, missed dinners, glued fingers, painted clothes, and constant frustrations, everything negative simply vanished. Our team had built a great airplane. With experience, you can feel the aircraft and you know if it is bad, good or great. 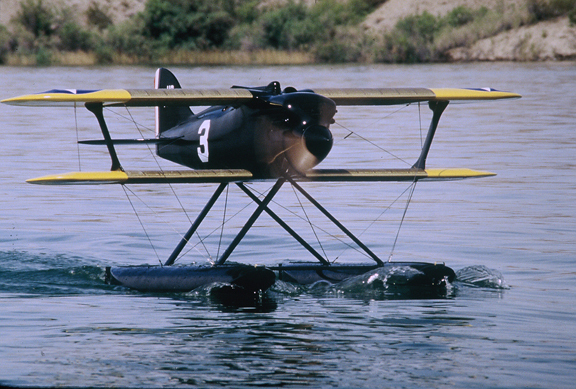 The Curtiss was great, and I had such confidence in the plane that I turned to the press and asked: “Where do you want it and at what attitude!” When the photographers were done, it was time to get our bird back on the water. As predictable this aircraft had been so far, I felt confident in the landing. With flying wires, floats and two wings, I thought I would need a little power to control the glide slope. I set up for what I thought would be a touchdown right in front of us, and as she flew by some 20 feet altitude, I decided to go ahead and land. I had a whole lake in front of me and I eased her down some hundred feet away. Behind me, I heard the builders start to breathe again. I taxied back, had great water control and the day was a huge success. After the first flight, we brought the Curtiss back to Bob’s shop to check it over. We found that our flying/landing wires were not strong enough. One was broke and the others showed fatigue. We replaced the clock spring Proctor flying wires and brass turnbuckles with 303 stainless strips, custom clevises, and steel turnbuckles. Re-rigged and tuned, the Curtiss never needed further attention. We made several more flights, partly checking out everything, learning the takeoff procedure, but mostly because it was a blast to fly. We live on a lake that is a recreation area and there are a lot of boats out every day. When we flew the Curtiss, it would draw a lot of attention and boats, sometimes blocking the landing area which provided us with some excitement sometimes. Bob kept saying that the Curtiss was a great flying airplane, just as Doolittle noted of the original. All future flights proved that even the take-off was predictable. Bob would give it full throttle, full up elevator and when the Curtiss was ready it would pitch up, he would give down elevator until level and fly, just like Doolittle. If you wish to build one of these magnificent aircraft, you no longer have to scratch build one. There are now companies that will cut you a kit.